Very dense arrangement of 105 focus points with phase-detection AF and 171 focus points with contrast-detect AF ensures precise acquisition of the intended subject with dense coverage of a broad range of the frame. 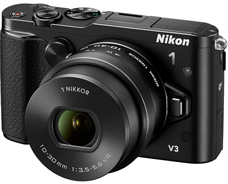 The Nikon 1 V3 is the first Nikon 1 camera to be equipped with a virtual horizon function that can be displayed in the live view display or viewfinder, and is capable of detecting not only roll (camera tilt to the left or right), but also pitch (camera tilt forward or back), a capability previously limited to high-end digital SLR cameras. This function is very helpful with framing of images of landscapes, architecture, and still objects. What's more, the virtual horizon functions not only with shooting in landscape orientation, but also with shooting in portrait orientation. When viewing images in the LCD monitor, the Highlights option can be used to check image highlights (areas that may be overexposed). Highlights will flash in the monitor display. 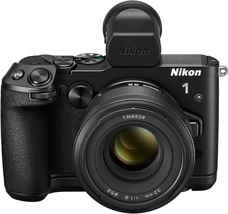 The Nikon 1 V3 is equipped with a main command dial on the back of the camera and a sub-command dial on the front of the camera. This allows users of digital SLR cameras to apply and adjust settings such as shutter speed in a familiar manner. The 0.48-inch, approximately 2359k-dot color TFT LCD viewfinder with frame coverage of approximately 100% supports diopter control and brightness adjustment. It ensures a broad field of view equal to that of digital SLR cameras, for precise framing with confirmation of the subject to all corners. In addition, adoption of the same rounded eyepiece used with the cameras such as the D4, Df, and D800, the DF-N1000 supports full-scale shooting capabilities. This optional grip is equipped with an angled shutter-release button that is easy to use, a function button to which a preferred setting can be assigned, and a sub-command dial that can be used to adjust settings. Adoption of a magnesium alloy ensures great strength and durability. The GR-N1010 provides a secure grip on the camera, even when the Mount Adapter FT1 and a NIKKOR lens are used. The slim LCD monitor, with a depth of approximately 4 mm, is equipped with a tilting mechanism that allows it to be tilted down to approximately 87° for high-angle shooting, and up to approximately 170° for low-angle shooting, allowing users to adjust their angle according to the subject or scene to be captured. In addition to positioning of buttons on the vari-angle monitor for an operational feel similar to that of digital SLR cameras, adoption of a bright and clear, 3-inch, approximately 1037k-dot, electrostatic touch screen enables simple and intuitive shooting operations by allowing users to touch the screen to focus or to select a subject for subject tracking. Adoption of a new Super high-speed AF CMOS sensor and the new EXPEED 4A image-processing engine enables the capture of images exhibiting excellent definition and very little noise at sensitivities of ISO 160-12800. This makes capturing images with which noise has been effectively suppressed for superior image quality possible, even with shooting in dark or dimly lit surroundings. In addition, still images with which noise is suppressed and superior image quality is preserved can be captured at high sensitivities using the noise reduction function, with which the camera takes multiple shots that are then combined to create a single image. *1Among lenses (for digital cameras with interchangeable lenses) equipped with power-drive zoom available as of March 13, 2014. Statement based on Nikon research. *3Measured in accordance with CIPA standards. When a CX-format digital camera is used; measured with the zoom lens at the maximum telephoto position.